4000 BC (circa): Estimated time-table for the beginning of the divide of an original Indo-European language into separate linguistic paths. The identity and original location of this culture is the subject of much speculation. 3500 (circa): Proto-Armenian tribes develop a culture that evolves around agriculture, metal working and animal husbandry. Recent archeological discoveries highlight several agreements between this thriving civilization in the Armenian highland and Indo-European culture. 1500 - 600 BC: Urartu emerges as a formidable military power. Cuneiform is used as a way of record-keeping. First usage of dividing a text into separate paragraphs appears in Urartean artifacts. By 8th cent. BC, Luwian, Urartean, Hurrian, Hittite and Thraco-Phrygian linguistic components merge to constitute the basis of the Armenian language. 700 BC - 300 AD: Cuneiform is substituted by Greek and Assyrian/Aramaic letters as means of scriptures. 300 - 100 BC: Works on language by Plato and Aristotle provide the first grammatical textbooks. The “Art of Grammar” by Dionysius of Thrax serves as the model to arrange the fundamentals of Armenian grammar. 301 AD: Conversion of Armenia to Christianity. In order to propagate the new religion, every element, including written records related to the pagan past, is destroyed. Pagan temples that were also centers of learning become a particular target for destruction. 405 (Circa): Invention of the Armenian Alphabet by Mesrob Mashdots, under the auspices of King Vramshabouh and Sahag, the Catholigos. Details of the birth of the letters are described by Gorune in “Life of Mashtots”. 405 - 500: Golden Age of Armenian language and literature. - During this period, 5 notable authors: Agatankeghos, Pavsdos of Buzant, Yeghishe, Movses Khorenatsi and Ghazar Parbetsi, although contemporaries, use different styles and frameworks to write on historical events taking place in the Armenian homeland and its past. - David, becomes the first Armenian grammarian to question the fundamentals articulated by Dionysius Thrax and develops his own theories on language, grammar and etymology. - Two separate groups of linguists/writers embark on identifying and translating important works of the era from other centers of learning. 425: First translation of the Bible into Armenian. A second revision of the Armenian Bible from Aramaic and Greek texts finalizes the translation. 8th Cent. : A series of Sharagans (hymns) help develop Armenian poetry dedicated to spirituality. Among many noted authors are two female poets: Sahagtought Sunetsi and Khosrovitought Koghtnatsi. Stepanos Sunetsi (735) pioneers Armenian phonetics and pronunciation. He elaborates the principles for the precise articulation of separate sounds and syllables and makes the first classification of Armenian vowels and diphthongs. 10th Cent. : The city of Ani, capital city of the Pakradouny dynasty, becomes the spiritual and intellectual center of the Armenian Kingdom. In “Definition of Grammar”, Krikor M. Pahlavouni elevates the art of grammar to new levels by his comparative studies of Armenian with other languages. In addition to his comparative studies, he also writes to object the method of free etymology and elaborates the principles of linguistic borrowings. Vartan Anetsi (11th century) and Hovhannes Sargavak also make more than casual contribution to enrich the language. 951 - 1003: Although written in classical Armenian, the “Book of Lamentation” by Gregory of Nareg elevates the language to new heights in terms of literary style and vocabulary by using words borrowed from vernacular Armenian as well as his creative ways of coining new compound words. 1080-1375: The center of Armenian linguistic and literary evolution shifts to the Kingdom of Cilicia. A new branch of grammar, “the art of writing”, is established. The first orthographic reform is also carried out. 12th - 13th Cent. : Vernacular Armenian spreads into literary works. First attempts to improve the system of declension and simplification of syntax are made. - M’khitar Kosh and Vartan Aykegtsi revive the traditions of the ancient Armenian folklore by writing fables in middle (proto-modern) Armenian prose. 1200 : The “Art of Writing” by Aristakes kritch includes scientific remarks on the spelling of difficult or borrowed words. His orthographic principles serve as the basis for subsequent orthographies. 1269: Vartan Areveltsi writes two of his grammatical works in Ashkharhapar (vernacular Armenian). His “Parts of Speech” is the first methodical attempt to articulate the principles of Armenian syntax. Incidentally, Areveltsi predicts that the languages will disappear in the future and humanity will use one language. - In a valuable textbook, Hovhannes Yerzngatsi challenges Plato’s contention of the divinity of languages by considering language a human achievement and not a divine invention. He also believes that grammar helps to eliminate obstacles between human thought and speech. - Gregory of Datev revises the definitions in the works of Arisdages and Kevork Skevratsi and makes new suggestions on improving orthography and the cases of declension. - Hagop Khrimetsi writes “About the Stress and Interrogation Mark”, a well-known work on the Armenian language in the medieval period. - Essai Nshetsi finishes his work “The Definition of Grammar”. - “A Brief Study of Grammar” by Arakel Sunetsi pays attention, for the first time, to the biological basis of speech. 1301: Among the great number of Kevork Skevratsi’s works are three grammatical texts related to the principles of syllabification, pronunciation and orthography. 15th – 17th Cent. : After the fall of the Armenian Kingdom of Cilicia in 1375, repeated destruction of Armenian monasteries and dispersion of the Armenian population by Memluk, Mongol, Tatar and Turkic tribes disrupted the cultural evolution of Armenians. 16th & 18th Cent. : The dire conditions of the Armenian homeland offer the opportunity to Kousans (lyrical singers) to gradually imprint poetry with secular outlook. Ghazar Sepasdatsi, Vrtanes Srngetsi, Gregory of Van, Stepanos Varaketsi, Nerses Mokatsi, Stepanos and others deal primarily with the preoccupations of Armenian populations living under the yoke of Persian and Turkic rulers. Later, Sayat Nova, the poet/troubadour, paves the way to a new era in Armenian poetry. 18th Cent. : New centers for learning develop outside the Armenian homeland. - Printing houses are established in Venice (1511), Amsterdam and Marseille. - Foundation of Mekhitarist monastery in Venice in 1717. The stated mission of the monastery is “The spiritual enlightenment of the Armenian Nation”. - First Armenian newspaper, Aztarar, is published in 1794 in Madras, India. - Institutions of higher learning with secular outlooks are established. Lazarian Institute is founded in Moscow (1815). Samuel Mourad College is established in Paris (1837). 19th Cent. : The division of the Armenian homeland between Russian and Ottoman Empires leads to the beginning of two separate Armenian cultural hubs centered in Tiflis (Tiblissi) and Constantinople (Istanbul). 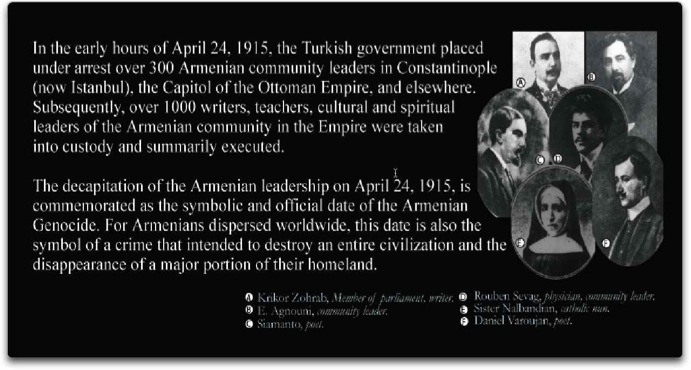 1915: On April 24, 1915, Ottoman authorities arrest and ultimately assassinate the entire intellectual elite (writers, teachers, poets) of the Armenian population. Soon, the Genocide of 1915, perpetrated by the Turks, wipes out the Armenian population of Historical Armenia. Survivors carry with them their only remaining possession: Western Armenian linguistic heritage. 1920: A small portion of the Armenian homeland becomes part of the Soviet Union. In the following 50 years limitations on intellectual freedoms and Stalinist purges disrupt the normal evolution of the progress of Eastern Armenian version of modern Armenian language.